How to read a letter. Or rather how to get as much information as possible from an old letter. The date stamp is crucial. All stamps were 'franked' which means a legible outline was stamped in black ink over the existing stamp with the whereabouts the letter was being posted from and the date, including the year. The stamp also gives information wider than itself. 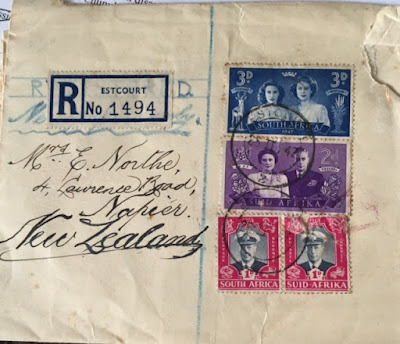 In this case the letter is franked 16 April 1942, New Plymouth, NZ. The stamp is of a Maori whare (house) and is finely etched. In 1940 it was one hundred years after the signing of the Treaty of Waitangi. New Zealand effectively dates itself from February 1840 when the Treaty was signed between Maori and Queen Victoria. In 1940 there was a celebration of New Zealand being one hundred years old. Hence the picture of a Maori house: it evoked the early world of New Zealand, its 'authentic' origins. But it was also made 'antique' by being so finely etched. This meant it belonged in another world. It was not strictly speaking contemporary. But there was a problem in 1940. The world had erupted into global war. New Zealand as a British Dominion as it was called - this means an independent state that was in the British Empire - sent troops to Europe and the Middle East to fight for what was conceived as 'the motherland' - Britain. This was partly because most New Zealanders of European descent were originally from Britain and Ireland. They were part of one of the great tidal movements of people in the 19th century, when the Anglophone world (people who speak English) spread out all around the globe in a desperate hope of making a better life than that in an overpopulated industrial Britain - or famine-struck Ireland. In some ways it was not unlike the great movements of population today. But one hundred years on New Zealand sent its army to Europe to fight. It was relying on British imperial power to protect it, especially from Japanese fascism. However the British army had the most resounding defeat in its history in 1942 when the British army surrendered without a battle to the Japanese in Singapore. This is popularly considered the date that the British Empire, in effect, ended. It left New Zealand and Australia undefended. Their armies were away from home. One could call it an hallucination arising from displacement, but at the time it seemed more important that Britain was saved than New Zealand. New Zealanders got a rude awakening in 1942 when the Japanese air force bombed Darwin in Australia, sinking 11 ships and killing 235 people. Japanese submarines sank a ferry in Sydney Harbour. Waves of panic swept through Australia and New Zealand as people realised they were essentially undefended. So that is the back story behind this date, and that stamp. The letter was sent by my mother's elder sister to her in Auckland, recommending that she abandon Auckland and try and get down to New Plymouth, a rural area on the West Coast. There she had friends who had a farm. The idea was she would be safer there. As it was the Americans entered the war after the Japanese bombed Pearl Harbour. The Americans came to New Zealand which became a base for the war in the Pacific. Many women's lives were changed forever when they met American servicemen. To many of the women the men seemed to have stepped out of a film and into their lives. They were used to New Zealand men who were awkward and little given to social polish. So while this appears a very simple stamp, with a clear franking on it, there is a story to be told if you delve just below the surface. Dates are not neutral things, especially in terms of people communicating to one another. When horrible things happen friends get in touch with friends, family members reach out to family members. In this sense a date becomes like a lynchpin joining everyone together. So that is the story behind this very simple image. Katherine Mansfield, a visitor to Hawke's Bay. I'm aware it's an age since I posted anything on here so I thought I would begin posting occasional articles that I write, reviews etc. Below is a review of a rather interesting book that has come out on Katherine Mansfield's most indepth experience of New Zealand landscape. This was when, as a 19 year old, she went on a 'tiki tour' (meaning a journey) in the area of Hawke's Bay, going up towards the Ureweras and Lake Taupo. This was before she left New Zealand never to return. So the journey is of great importance - it gave her an insight into landscape, the wairua (soul) of place. And as she crosses over what I might call 'my territory' which is Hawke's Bay the book had special resonance for me. The book below is based on the scribblings Katherine Mansfield did as she journeyed along. The Napier Taupo road has the high status of being one of those roads on which you lose cell phone coverage. This means you leave behind the 21st century. You plunge into the uncertainties of real time, presented naked of technology to the landscape. And the landscape itself is powerful. There are still very few ‘amenities’ along this twisting, tormented and lonely road. In fact the only amenities – attempts at hostelries offering hot coffee and toilets - echo the four stages that horses and stagecoach could reach in a day. There is none of the effluvia of contemporary life – no McDonalds, no Huntervasse toilets, no car yards. In fact there are no petrol stations. This is by way of saying the Napier Taupo road is still a dramatic setting. And it was on this seemingly mysterious stretch of nowheresville that Katherine Mansfield found her one and only completely New Zild Gothic story, “The Woman at the Store”. This is a story that is at least as much Ronald Hugh Morrieson as fluttery fluting Mansfield. It is realist, twisted and vicious. And sad. It has the melancholy of lives left behind that have curdled – in other words a typical New Zild narrative arc. And this little pearl of a book, “The Urewera Notebook”, edited by Anna Plumridge, tells us it was based on one Helen Himing (date of birth unknown) who was the wife of a roadman who tended a lengthy and lonely stretch of Napier-Taupo Road. Anna Plumridge is one of those literary terriers to whom you give a simple and seemingly banal fact and she will thrash it back and forth until the poor fact leaks out its origins and everything it can divulge by way of information. This is code for saying this rather prim hardback is a doctoral thesis warmed up for publication. I hasten to add it isn’t trussed up in that clunky university-speak that shows no respect for language. It is fairly speckled all over with insights both large and minute. The book is based on Plumridge’s intensive research into the 3 week voyage into “a heart of darkness” that Katherine Mansfield made as a sulky 19 year old in November 1907. The road trip went from Hastings, along the Napier Taupo Road, branched off towards the Ureweras, headed up towards Rotorua, down to Taupo and back along that dismal road to Napier. This took place in between her first introduction to life in London, a return to the tiny town antics of provincial Wellington, and her swift removal to the Centre of it All (London in 1908) where she stayed for the rest of her life. In a way the notebook has the interest of a major artist confronting essential Aotearoa, scribbling in her notebook as she went. It is kind of apprentice material in which “Kathleen Beauchamp” tries on a thousand and one costumes before the admiring mirror of a self. “I look completely charming” she notes at one point, taking a snap of herself as she sat on the train from Woodville. She also records vivid glimpses of what she sees. And as it is 1907, she sees an awful lot. It was, after all, a slim forty years since the land wars, with all this meant in terms of appropriation, loss and damage. It was also less than a century since the dystopian “musket” wars that had effected a kind of tribal ethnic cleansing from one end of the North Island to the other. Kathleen Beauchamp was looking at and travelling through a disruptive landscape – but one that she found extremely fascinating and beautiful – mysterious, and “other”. And like that experience of suddenly losing cell phone coverage – it felt very real. One of the larger questions Plumridge looks at is whether Kathleen Beauchamp was the nightmare teenager frumping round Wellington, hissing like a cat when she wasn’t scratching the furniture in her fury at not being back in cosmopolitan London. This has been a pretty standard trope for a long time. But the evidence supplied by Kathleen’s own diaries is that she was that quintessential kiwi lass – a good sport. She walked in the dust up mountainous roads when the horses couldn’t cart the humans any longer, she went “in her nakeds” into hot pools, she looked, she laughed, she wrote. Her companions on the tour - who could have dobbed her in - talk of her humour, kindness and interest. It may be a fact that Kathleen Beauchamp was a 19 year old having the time of her life roughing it in old Aoteoara. I sometimes thought with this book that Mansfield herself was a kind of unkempt landscape that various voyagers travelled into and brought back interpretations which were only ever approximations of something inherently undiscoverable. She remains, a little like the landscape of Aotearoa itself, wild, mysterious, other. The first “discoverer” of the notebook was that cad Middleton Murray. It is hard to think of a man with worse press than the unfortunate repository of Mansfield’s amatory writing. She needed a romantic object to whom to send her immortal letters about love and marriage. She created a fictional Murray who so often disappointed her bitterly either in person or in his failure to understand just how terrible her predicament was – a young woman in her early thirties facing death in a foreign hotel room. Her disease – tuberculosis – was notifiable and needed to be hidden if possible. If discovered she could be ejected from the room on the spot and might even have to pay special cleansing costs. He really wasn’t interested. After her death of course Middleton Murray minted the Katherine Mansfield that became a 1920s legend. She was in a way his greatest literary production. He culled her lovely bitchyness, he tidied away the mess of a pregnancy. Certainly gonorrhoea was not a saintly attribute. Murray didn’t know anything about NZ and apparently didn’t even bother to look at a map. His understanding of the notebook is full of gaffes so bad – from this end of the telescope – as to be laughable. His knowledge of Maori was nil. Professor Gordon dusted down the notebook and applied his own magic. It was he in fact who fictionalized these scrappy doodlings into the rather formal and impressive title “The Urewera Notebook”. Fact: the notebook had no such title. It is my assertion that conferring such a weighty moniker on these slight impressionistic jottings risks overwhelming them with connotations of the Clytemnestra of NZ history, Dame Judith Binney. It gives the notebook a gravitas, a sense of tragedy that is too consciously nationalistic, too embedded in the fraught weightings of contemporary political correctness. Fact: Kathleen did indeed go to the Ureweras on her trip but it was only a small part of the journey. It took three days. The notebooks could have as easily been called “My Summer Hols!” as this is probably closer to the teenage narcissism and slightly jejeune and jolly tone that underlies much of the writing. But of course that is really not a good marketing ploy and it underplays the goddess role that Mansfield occupies at the very apex of our national literature. Everything the goddess touched becomes sacred. Plumridge has done a stellar job hunting down the merest hint of a detail and supplying information that may explicate it. She also supplies some context for throw away remarks by Mansfield which may have been misunderstood. Her infamous dismissal of Pakeha as “the third rate article” seems to point to an infinite disdain. “Give me the Maori or the tourist – but nothing between”. This makes more sense if you relate it her rampant colonial snobbery. The “real English” article she fawns over is actually an individual with the unglamorous moniker of Prodger. Prodger’s great virtue is his father was an aristocrat and his younger sister managed to snavel the 18th Lord Sempell and the 9th baronet of Craigievar (the same person, she wasn’t a bigamist). We all like a good title. Perhaps a truer note here for Kathy the good sport is when she writes home to Mum and lets slip that “I’m quite fond of all the people – they are ultra-Colonial but thoroughly kind & good hearted & generous – and always more than good to me.” This is probably a saner assessment of what Mansfield really thought about the people who were, ethnically and culturally, of exactly the same background as herself. She dropped the lorgnette and got real. It is notable that on the whole the 19 year old colonial had a refreshing openness to Maori that she met. Given this was the highest arc of imperialism and hence patronising ways of looking at non-British races, she is nearly always looking at the human, the individual, the person. Part of this is her openness to physical beauty. She especially loved handsome or striking Maori women and Maori men. There are many descriptions of their physical attractiveness, the way they distinctively dressed, that sudden rapport which is not part of Anglo-saxon cultural etiquette. She commented on the greenstone jewellery worn, the clothing, the long luscious curls of men of the followers of Rua. She tried to write down Maori sayings and showed an openess to tikanga Maori that is surprising given the period. She did hate the commercialisation of Rotorua. Yet in fact it was just the kind of setting she later deployed in a masterly fashion – hotels – alienation - transience – the sale of love. Mansfield’s ambivilance towards her NZ identity is often seen through her complicated family relationships, her defeats, her own betrayals. Yet the evidence in these free-flowing jottings is that she was a rapt inhabitant of Aotearoa, lens wide open, fresh to impressions and storing away information for later deployment. In the end that is the interest of this notebook. Nowhere else do we have a record, made on the spot, of how she responded to her native country. It is as real and close as it could get. It wasn’t Aotearoa as she looked back with longing, after the shock of her brother’s death. Here she is not trying to reclaim it, as a loving testament to memory. It is as it was lived. Vivid, real, moment by moment, closely observed. That is its great virtue. In the end the gypsy caravan traipsed back along that endless Napier-Taupo Road. It was on the return journey that Kathleen came across the setting for “The Woman at the Store”. Plumridge reconstructs the scene through the words of fellow traveller Elsie Webber (aged 12 to Kathleen’s 19). They knocked on the door of a cottage “at a very lonely, isolated spot” to ask if they could pitch their tent on the property. The door was opened by “a cheerful blowsy woman” who was thrilled to see some humans. “Come in and sit down. I’ll make a cup of tea. I haven’t got me drorin room boots on!”[drawing room boots]. Kathleen’s sharp ear for dialogue was captured by this. But it was the crushing sense of isolation, the lurking menace of the landscape which spoke to Katherine Mansfield and so she constructed her gothic story with its hints of violence, madness, repressed sexuality and death. It is to Plumridge’s credit that she completes the story for us. Long after Kathleen’s party had disappeared Helen Himing vanished. “…several days after being reported missing, her body was found in the hill country near Rununga.” In her own way Helen Himing provides a small footnote for this larger journey of a writer apprentice who, having passed through her native land, looked at it sharply - and never came back. A rather funny thing happened to me last night. I was browsing through Facebook when I came across a friend saying he had given up on reading The Luminaries, the current winner of the Man Booker Prize. In fact he was giving up on his second attempt. I saw there was a comment below it, so I opened it up. The contents were rather startling. 'I also find all of Peter Wells' writing boring,' someone said. I felt myself go into that curious reversal known as shock. Immediately I asked myself - God, is my writing boring? This at least gave me some context. But it didn't change my sense of self doubt. Maybe I had become a boring writer over time, I wondered. But then he implied I was a boring writing from the very start. Reviews tend to follow the same pattern. I think I've only had one book that had universally excellent reviews and that was 'The Hungry Heart', my book on William Colenso. In my earlier writing life, when my books were much more concerned with the landscape of homosexuality, the reviews tended to be much more polarised, depending often on the reviewer's own attitude to gayness. Here I'm including some of the reviews for my latest book, Journey to a Hanging. I should say first of all, the reviewing pattern was very unusual. I had an early, and excellent, review before the book was even in the shops. (Metro). But this was followed by a long - and for me, worrying - silence. This went on for weeks, until it reached a point whereby I no longer raced down to get the Saturday papers and wrenched open the book pages. I only felt disappointment. In the end I succumbed to melancholy. The book 'had sunk like a stone' I told myself. Instead of controversy, which I had expected, there was just an unending silence. A wise writer friend of mine counselled me by saying it is a big book to read and it will take reviewers time to respond. This in the end turned out to be true. The reviews in the major papers all came out in the same week - apart from one startling anomaly, The Herald which has still not reviewed the book - and may not be doing so. The reviews went from as good as I could hope for (as I said to a friend, I couldn't have written a better review if I'd written it myself) through to a doubting review. I have to admit to reading the favourable review and not reading the unfavourable. I will read the latter in due course, when its sting is less. invention of the computer and the fact you're always working with a clean copy made me get over a chronic indecisiveness. With 'Journey to a Hanging' I did question myself deeply about what appeared or even appears to be its lack of momentum with its reception. I felt that CNZ had interfered with my project with (well meaning but nevertheless destructive) political correctness concerns, altering the emphasis of the story. But in a larger sense, for the dominant Pakeha public, it is just a turning of the back onto the past, preferring silence and obliteration - allowing the Waitangi Tribunal to enact justice, sort of behind the back of the general public. And of course the subject matter of 'Journey' is disturbing. This is an important factor. These are all factors in how a book is received by the general public. As a writer you become aware of this belatedly, looking backwards. I also question some smaller aspects of the book production. I didn't like the title and wanted 'A Walk At Night Without Stars'. I was told this was uncommercial. Its cover also tends to imply a boring historical book, a fact I argued at the time. I also disliked intensely the subtext, about 'race relations'. Personally I would always avoid a book which is 'about race relations' - a dated terminology which seems to evoke a pathological political correctness. I was over-ruled on these almost subconscious choices which nevertheless remain very important. (The look of a book, the sound of its title. Its feeling. How it reaches out to you…) I was told I was 'uncommercial' in my concerns and that the publishing 'committee' knew better. These are smaller details, but not unimportant ones. I will put the image I would have liked at the front of this blog. I like the image as it suggests a contemporary take, a kind of parallel reality which goes with the way of writing in the book. Below is an illustrated talk I gave recently in Auckland. It's a precis of a longer talk, at times a bit vague, but it covers my journey in writing 'Journey to a Hanging' in its varying moods - pensive, worried, pleased, and in the end, feeling a sense of infinite relief. Alas, while giving the talk, I left out a beautiful quote from Mark Twain on the sound of the waves in Napier which he noticed when he visited Napier in 1895. 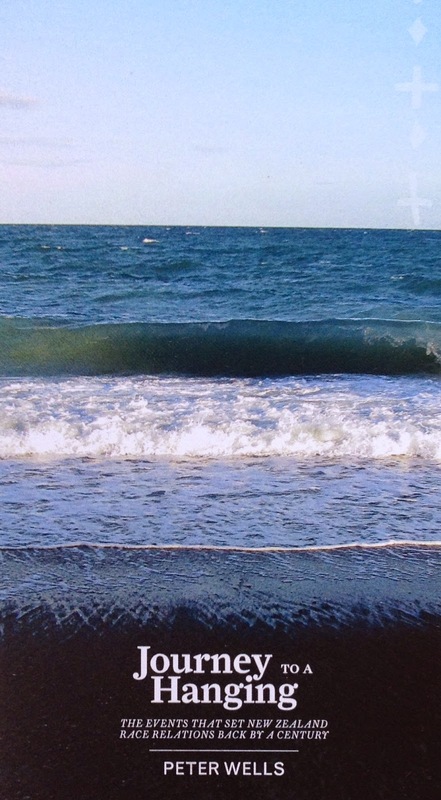 He was staying in the Masonic Hotel which faced the beach and he woke up in the night and noted down the very special melancholy of these waves, which he also decided were a great solace. Labels: Kereopa Te Rau, Mark Twain, Napier, Napier prison.